Best gift & school project material.Wonderful home or office decoration. Warning: CHOKING HAZARD - Small Parts. Not for children under 5 years. 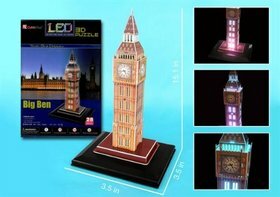 ** Educational, entertaining & creativity stimulating LED 3D Puzzles Game. ** The structure measures 3.5 inch long by 3.5 inch wide by 15.16 inch tall. ** Comes with an LED base that colorfully lights it up from the inside. ** Material is safe & eco-friendly. ** Convenient to assemble, No scissors or glues required. ** Instructions are included, For ages teen to adult. ** 3 x AA batteries required (not included). ** Best gift & school project material. ** Wonderful home or office decoration.